Finally resurfaced after months of delay, Second Road quickly has become pothole-ridden again, with conditions near Mike Shopping Mall so bad locals have renamed the busy thoroughfare “Meteor Road”. 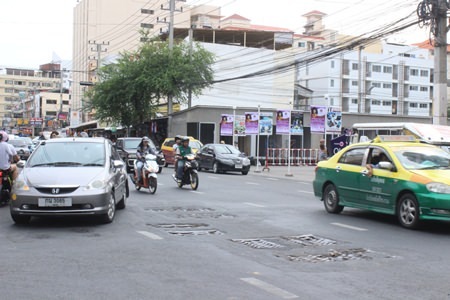 Eight potholes were found near the Soi 12 mall May 9, infuriating local residents and business owners who waited more than a year to have Second Road entirely resurfaced, only to see it deteriorate practically before the paint on the lane lines was even dry. Even after resurfacing 2nd Road, the perennial problem with the drainage grates opposite of Mike Shopping Mall has residents calling for city hall to fix it permanently. 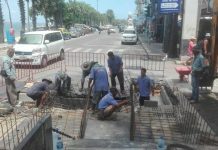 Many allege that only the contractors and those who hired them at city hall benefitted from the 37-million-baht contract. The new surface of the road is up to 40 centimeters higher than before, but the street was not graded to level out preexisting drainage grates. The uneven surface, combined with multiplying numbers of potholes, had made the road treacherous to drive. Pattaya residents are demanding that city hall fix the problems quickly, once and for all.